It is said in these surroundings, that in 1815, Napoleon was on the Quinta. In fact, what can be confirmed is that Napoleon Bonaparte was passing through Madeira, aboard the Northumberland ship that would take him to exile on the island of St. Helena. It is known that the journey began on August 7 and arrived at St. Helena on October 15, 1815. The builder and original owner of this Quinta, Sir Henry Veitch, at the time the British Consul in Madeira, on the 23rd August 1815, was the only person who was allowed to board the ship and be able to visit Napoleon. It is said that he did it because he was the only one to continue to treat Napoleon by “Your Majesty”, while all the others referred to him only by General. The legend says that Henry Veitch, moving all its influence with the Portuguese and British authorities, arranged everything so that Napoleon Bonaparte and his wife Josephine could go ashore, in secrecy, and stay secretly on the recent Quinta that Veitch had ordered to be built on Jardim da Serra, situated in the middle of more than 115 hectares of land and it was the "apple of his eye." The Quinta was well known because of its legendary gardens, which were characterized by exquisite labyrinths of boxwood and the vigorous camellias, which can still be appreciated in the so-called "gardens of the Manor House". Knowing that Josephine liked to stroll in these gardens, which reminded her of times of the splendor and glory that she had known in France. 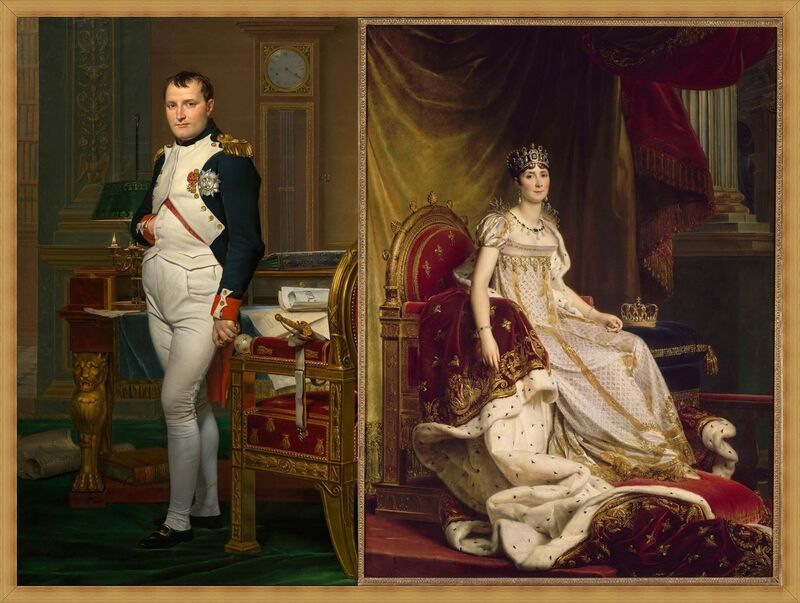 It is said that Napoleon and Josephine, on their arrival at the Quinta were installed in the best rooms of the house, and all the servants served in the best way he knew. Veitch, tireless in attention, offered his services to Napoleon, who showed willingness to receive some books, fruit and locally grown tea, sending at the same time to the ship a magnificent offer of fruits, sweets and old Madeira wines. Some say that Napoleon have sent to Veitch some gold coins for the payment of his hospitality and tradition also says that the Consul casted them on the cornerstone of the Anglican Church which was then being built in Funchal, when opening up the foundation for the construction of that temple, whose construction he was the major driver. Once upon a time, long long ago, a Scottish nobleman, Consul of England in Madeira visited the island and fell in love with a particular place that was located in the highlands of the island's south-west slopes. This place was full of native plants such as heather, laurel and whortleberry and was flanked by a watercourse. There was an area of this stream that had a water cascade, where it was said to be an enchanted moorish girl. The young Consul, amazed by the exuberance of nature in this area as well as by the legend, built a stately home, very close to the watercourse. It was said that the Consul had left England to forget the death of his beloved, recently deceased when giving birth. With the foundation of his mansion, the consul preserved the oldest native trees and introduced new species brought from all over the world. The planting of the trees was done only by women, because it was believed that their hands transmitted the fertility that was necessary for the proper development of the plants. In one of his morning walks around the property, the Consul was admiring the energy and stamina of those men and especially those women, some of them still with their children at the breast, that strive in working, due to their several needs. The young Consul then noticed a young woman, full of vice, brunette, with eyes of color of green pearls, dressed in white with black earthy apron. Oh! Her hands carried a heavy, pleasant smell, and the Consul, confused by so many feelings, asked: "Girl, where does the scent of your hands comes from?" To which she replied shakily, "it comes from the plants that I brought with my hands." It was a unique perfume, never before experienced by the people of the land, not even by the young Consul. The foreman interrupted with a strong voice, "this is one Eucalyptus tree that came from the Oceania ... At least that's what the man from the ship said." The Consul, exited, attended the planting of that tree as if it was the birth of his child. The young woman exuded, not only from the hard work, but especially by the presence of young and beautiful Consul. When she finished, the Consul said goodbye to her with one last look, one that needs no explaining. One of the older women said, "if the tree will grow like what it was born here today, there will be no other alike” this said, a deep silence struck up in the plantation works, interrupted only by a light breeze that refreshed the hot young girl’s face. From that day on, the Consul continued his morning walks that now included the area where the girl worked. One day, the Consul, depressed by news of England, that the wine that was exported had not arrived, went to clarify his ideas under the Eucalyptus; luckily the girl was watering the vigorous tree. She dared not to speak, but the Consul approached her, asked her permission to take her hands, looked her in the eyes and asked her to meet him at the end of each day, there, by the tree. The two fell in love and married in secret, though the Consul needed the approval of the young woman’s father, which was in India. The truth is that the Consul knew that his family would disown him if they knew he had married a young rabble. Each year the young Consul had to go on a trip to England, therefore he had to leave his beloved one on the island and leave for Britain. He said to his wife he would take one year to see her again, to be able to return and the girl understood but stayed with sadness in her heart. It is said that during this year the young girl visited, at the end of each day, the already huge Eucalyptus, she planted. It's been one year, two, three, a decade and the Consul never returned. For 13 years, the young girl waited and the legend says that the Eucalyptus was watered during that time by her tears and that during this time stopped growing. One rainy day, the old woman who once said that the tree would grow to be unique, said to the young woman, "The tree is growing again, it has now more than 1 meter of height." One day, after a week of rain, it was seen in the distance flocks of birds aggressively crossing the valley, huge thunders and lightings were lighting the skies. The people of the land, used to the quietness, became frightened and gathered on the Consul's mansion. It had stopped raining and behold, appearing at the entrance of Quinta, right next to the majestic and charismatic tree, the Consul on a horseback. The old woman exclaimed, "the tree that unites will only stop growing when it reaches the sky!" Of all the eucalyptus planted on the whole island, this one continues to be the highest one. And, for all of this, it is said that the one that comes to the Quinta and enbraces the eucalyptus, will find the eternal love!